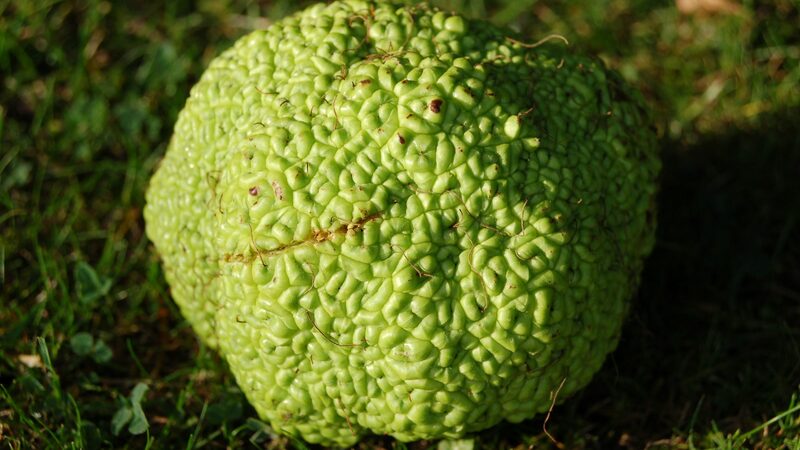 Maclura pomifera, is member of the mulberry family, and bears distinctive, inedible, yellow-green, wrinkled fruits. This native of the south and central United States was introduced into cultivation in 1818, and was named in honour of an American geologist, William Maclure. The distinctive fruits are formed only on female trees, and here we are fortunate to have both male and female trees growing alongside each other, to ensure fertilization. In its native country it is used as hedging. The fruits are hard to spot amongst the leafy canopy, but fallen fruits are often found at the base of the tree.